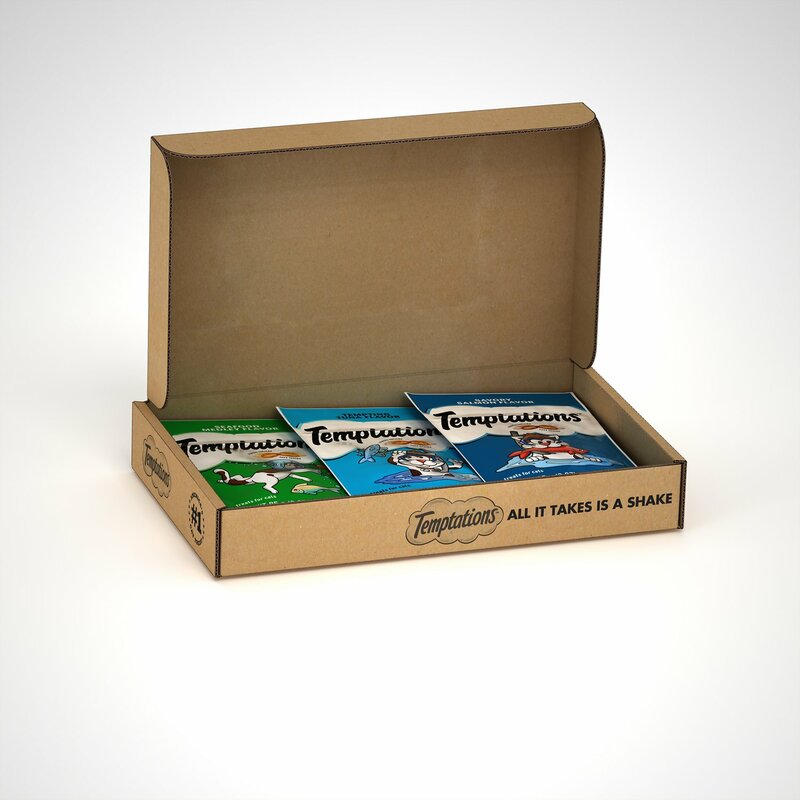 The Temptations Seafood Lovers Variety Pack contains four mouthwatering options your cat will love, including Seafood Medley, Savory Salmon, Tempting Tuna, and Ocean Whitefish. With such an array of tantalizing choices your feline friend will be excited to try every scrumptious flavor! 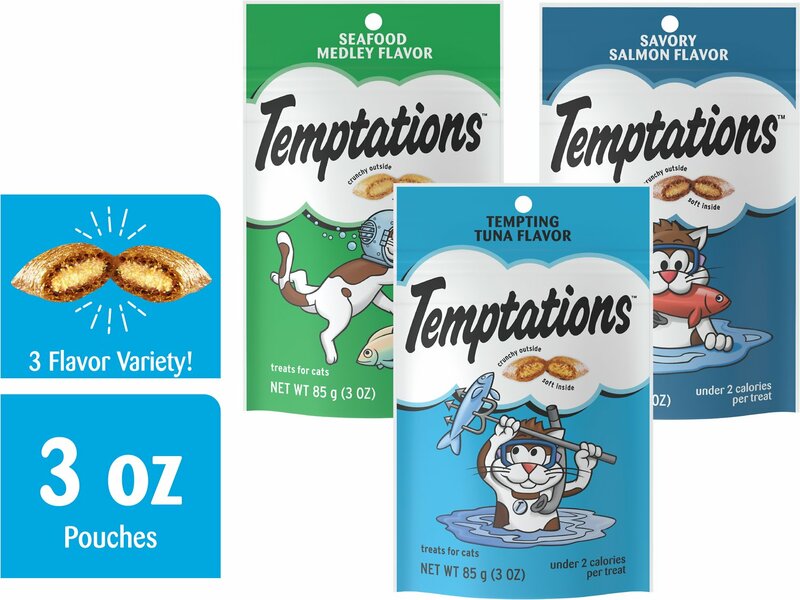 Your kitty will love the variety of Temptations four classic and irresistible seafood flavors which includes Seafood Medley (2), Savory Salmon (2), and Tempting Tuna (2). Seafood Medley: Chicken By-Product Meal, Ground Corn, Animal Fat (Preserved with Mixed Tocopherols), Rice, Dried Meat By-Products, Wheat Flour, Natural Flavors, Corn Gluten Meal, Potassium Chloride, Choline Chloride, Salt, Salmon Meal (Preserved with BHA/Bht), Calcium Carbonate, Dl-Methionine, Taurine, Vitamins (Dl-Alpha Tocopherol Acetate [Source of Vitamin E], Vitamin A Acetate, Niacin Supplement, Vitamin B12 Supplement, Riboflavin Supplement, Thiamine Mononitrate, D-Calcium Pantothenate, Vitamin D3 Supplement, Biotin Supplement, Pyridoxine Hydrochloride [Vitamin B6], Folic Acid Supplement), Minerals (Zinc Sulfate, Copper Sulfate, Manganese Sulfate, Potassium Iodide), Iron Oxide, Dried Cheese, Shrimp Meal. Savory Salmon: Chicken By-Product Meal, Ground Corn, Animal Fat (Preserved with Mixed Tocopherols), Rice, Dried Meat By-Products, Wheat Flour, Natural Flavors, Corn Gluten Meal, Potassium Chloride, Choline Chloride, Salt, Salmon Meal (Preserved with BHA/Bht), Calcium Carbonate, Taurine, Dl-Methionine, Vitamins (Dl-Alpha Tocopherol Acetate [Source of Vitamin E], Vitamin A Acetate, Niacin Supplement, Vitamin B12 Supplement, Riboflavin Supplement, Thiamine Mononitrate, D-Calcium Pantothenate, Vitamin D3 Supplement, Biotin Supplement, Pyridoxine Hydrochloride [Vitamin B6], Folic Acid Supplement), Minerals (Zinc Sulfate, Copper Sulfate, Manganese Sulfate, Potassium Iodide), Iron Oxide, Shrimp Meal. 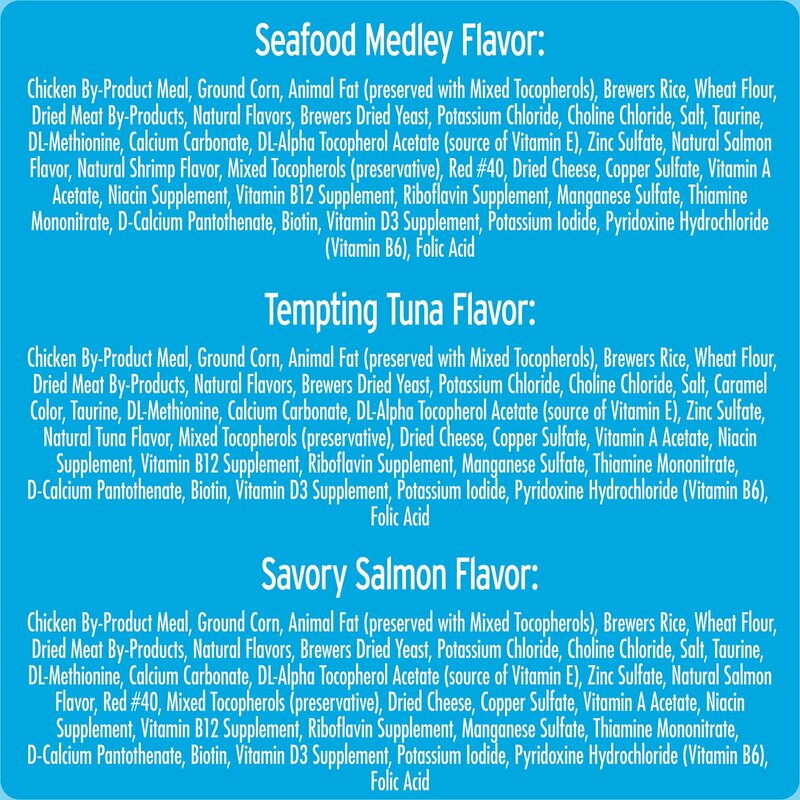 Tempting Tuna: Chicken By-Product Meal, Ground Corn, Animal Fat (Preserved with Mixed Tocopherols), Rice, Dried Meat By-Products, Wheat Flour, Natural Flavors, Corn Gluten Meal, Potassium Chloride, Choline Chloride, Salt, Titanium Dioxide Color, Taurine, Dl-Methionine, Calcium Carbonate, Vitamins (Dl-Alpha Tocopherol Acetate [Source of Vitamin E], Vitamin A Acetate, Niacin Supplement, Vitamin B12 Supplement, Riboflavin Supplement, Thiamine Mononitrate, D-Calcium Pantothenate, Vitamin D3 Supplement, Biotin Supplement, Pyridoxine Hydrochloride [Vitamin B6], Folic Acid Supplement), Minerals (Zinc Sulfate, Copper Sulfate, Manganese Sulfate, Potassium Iodide), Natural Tuna Flavor, Iron Oxide. 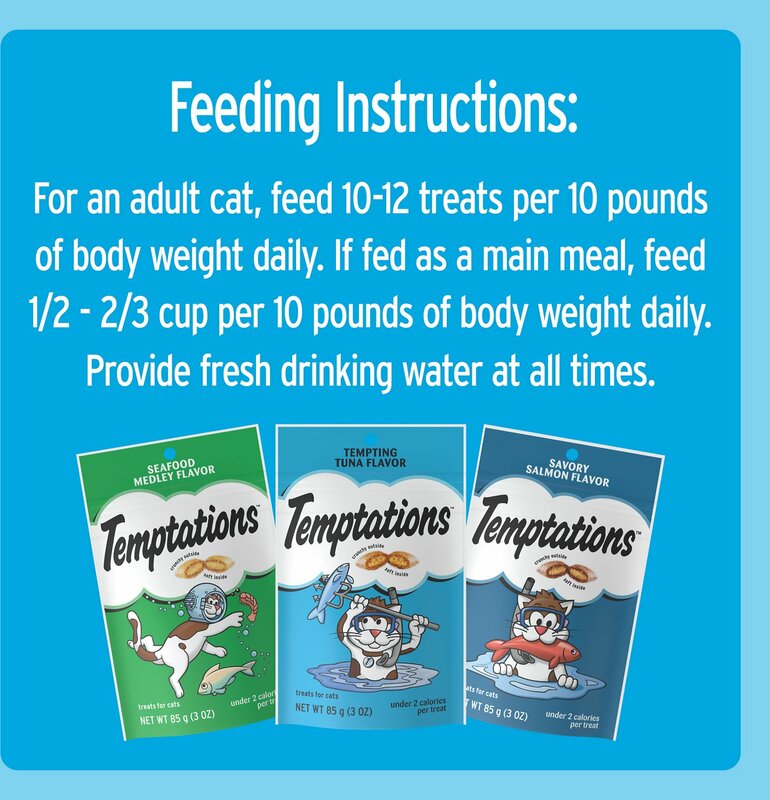 Feed 10 - 12 treats per 10 lbs of cat daily as a treat or snack. If fed as a main meal, 1/4 cup of Temptations Treats for Cats can replace 1/4 cup of WHISKAS MEATY SELECTIONS Food for Cats. Provide fresh drinking water at all times. Temptations cat treats provide the perfect combination of crunch and flavor! 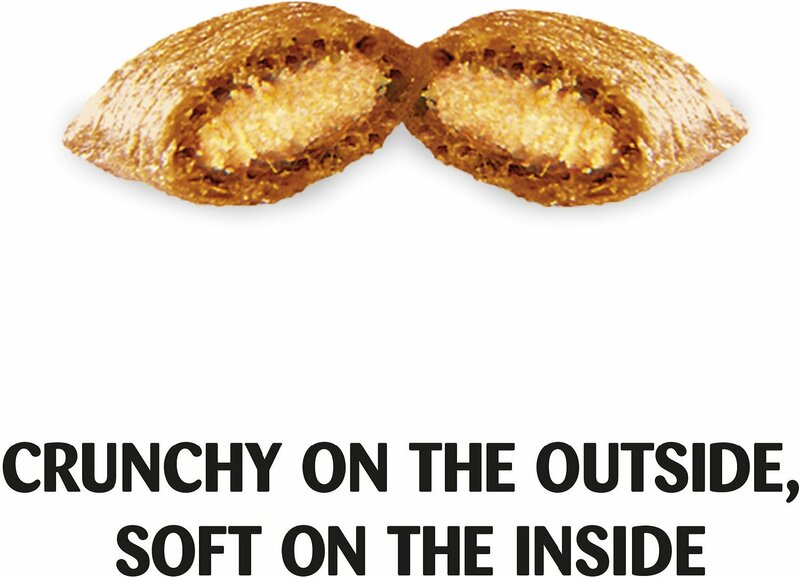 Each treat is irresistibly crunchy on the outside, and soft and savory on the inside. An added bonus, each bite-size treat helps control tartar and supports dental health. These enticing treats make the ultimate anytime snack that's sure to have your kitties running for treats as soon as they hear you shake the bag. And even though they're full of flavor, they're only about 2 calories each! Mix up your cat's diet with the variety of Temptations Mix Ups. No matter what your cat is craving, you can always switch up the menu with mouthwatering combinations—like Surfer's Delight, Backyard Cookout, Catnip Fever and more! Mix it up anytime with these low-calorie, guilt-free treats. When it works, it just works! You can always turn to Temptations Classics for a delicious treat with a crunchy texture and creamy middle that your feline will surely enjoy. Indulge your kitty with the flavors of Tasty Chicken, Hearty Beef, Tantalizing Turkey, Savory Salmon and more. These bite-sized treats can be used as rewards, for playtime or just because! 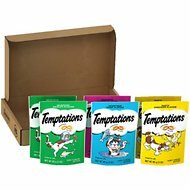 Temptations Jumbo Stuff treats are full of flavor and loaded with extra filling that will have your cat meowing for more. If your cat loves Temptations Classics, surprise her with these jumbo-stuffed treats. They have twice as much good stuff on the inside, with the crunchy outside that your fur baby loves! And because they're low in calories, you can treat your feline companion multiple times a day. 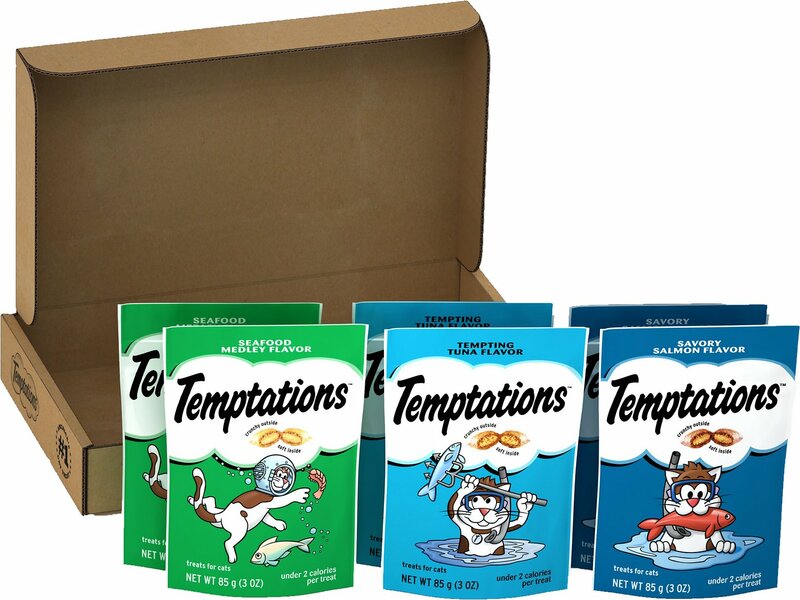 Temptations makes some of America's favorite cat treats, with more than 30 flavor varieties and many that offer health benefits specific to cats' needs. Temptations are one-of-a-kind, patented treats that are crunchy on the outside and soft on the inside—the perfect combination for a purring kitty. My cats love these treats!! Always have! This bunch is perfect because they stay fresher longer than the bigger boxes. Definitely will be buying again! My cats love these treats so much that when I say “ who wants treats?” All 5 cats come to the kitchen. I have to keep the treats in the cupboard because if I leave them out they chew the package open. My cats always love their Temptations treats. They like the flavor choices in this set. My cats love treats and this was a nice variety. Great treats for the ones you love. Grateful that these are being offered in a variety! My cats love them, and my vet was surprised at the improvement of my old cat's teeth (he's 16) when I started using them several years ago. This was a gift and the cat loved them. These treats it seems every cat loves. My male cat Bear loves these treats . . he starts talking when they arrive. He likes the crunch and salmon and seafood are his favorite flavors. Well, 2 out of my 4 cats LOVE Temptation treats, any and all flavors. My oldest and my youngest cats are at my side as soon as I shake the bag. They are addicted to them.